Situated squarely in the heart of the Cascadian giant tree forest, Washington houses some of the largest and widest trees in the region. The Olympic Peninsula and specifically, Olympic National Park, is perhaps the region’s most biodiverse and productive forest. The Park is home to four major temperate rainforest valleys, the Hoh, Queets, Quinault, and Bogchiel - which together make up a massive wilderness area of huge western red cedar, Sitka spruce, Douglas fir, bigleaf maple, and western hemlock trees. These are some of the rainiest and most lush places in all of North America. To the east, Douglas Firs and western red cedars grow at the foothills of Washington’s Cascade Range. As opposed to the near-constant rain that feeds the trees in the Olympic Peninsula and Washington coast, these trees are nourished by the ample snowpack that falls throughout the winter. The valleys of North Cascades National Park up into Lower Mainland Canada feature some beautiful overnight backpacking trails into prime virgin ancient old-growth forest. The most famous of Olympic National Park’s four rainforest valley’s, the Hoh is one of the finest remaining examples of temperate rainforest in the United States and is one of the park's most popular destinations. Throughout the winter season, the rainforest is almost always cloudy and frequently rainy. In fact, the Hoh experiences a total of 140 to 170 inches (or 12 to 14 feet) of precipitation each year. The result is a lush, green canopy of both coniferous and deciduous species. Mosses and ferns that blanket the surfaces add another dimension to the enchantment of the rainforest. The visitor’s center provides access to several short trails, including the famous Hall of Mosses (picture one) - an unbelievably lush grove of Sitka spruce, bigleaf maple, and western hemlock trees covered in green. Nearby, the appropriately named Spruce Nature Trail (picture two) also provides a stunning sample of the moss-laden scenes typical of the Hoh. The rainforest is also home to the Preston Macy Tree (picture three), formerly the the sixth largest Sitka spruce tree in the world now in a state of natural decomposition. One of the greatest hikes in Olympic National Park and all of Cascadia, the Hoh River Trail is a 24-mile roundtrip excursion passing through outstanding Sitka spruce, Douglas fir, and western red cedar groves next to a glacially-fed river. Some of the old-growth trees here are hundreds of years old, and reach gigantic proportions. The trail travels towards the center of the Olympic mountains and unlike most rainforest hikes, the end features a hike into the mountains to a spectacular view of the Blue Glacier near Mount Olympus. For giant tree fans, the best part of the trail is the first 10 miles (one-way) to Olympus Ranger Station/Lewis Meadows. The station is a campground that serves as a great turnaround spot for those who wish to hike at a leisurely pace on an overnight backpacking trip. Because of its relative inaccessibility, the Queets receives a fraction of the tourists that travel to the Hoh, helping it to retain a wilderness appeal. The rainforest is notable for some enormous trees, including the mossy Queets Spruce (picture one), one of the largest Sitka spruce trees in the world, and the Queets Fir, the thickest known Douglas Fir. The Queets River Trail begins with a ford of the Queets River, an undertaking typically unmanageable from the late fall through spring. As it travels deeper into Olympic National Park’s interior, it passes trees of magnificent size draped in ferns and mosses (picture two). 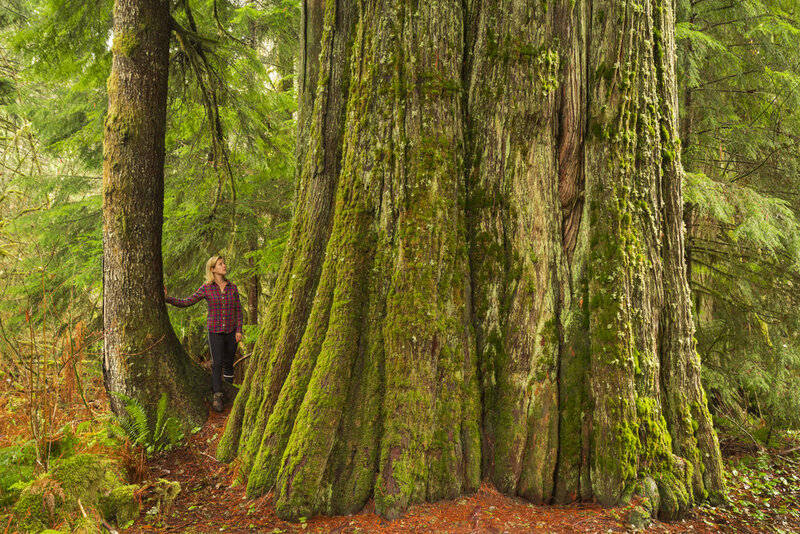 With the abundance of rain and constant mist generated by proximity to the Pacific Ocean, several western red cedar trees in the Park’s western end reach record sizes. Two ancient trees in particular attest to this phenomenon. The Kalaloch Big Cedar, (picture one) perhaps one of the gnarliest trees in the region, is covered with interlocking arms of wood extending from its base up through the trunk. The Kalaloch was already a strange-looking tree before a violent storm in 2014 ripped it in half and disfigured it even further. Nearby, stands The Duncan Cedar, also known as the Nolan Creek Cedar (picture two), another giant and a much more traditionally-looking cedar but its slow demise and exposure to the sun has bleached its massive trunk to an off-white color, helping it stand out from the surrounding newer, green forest. 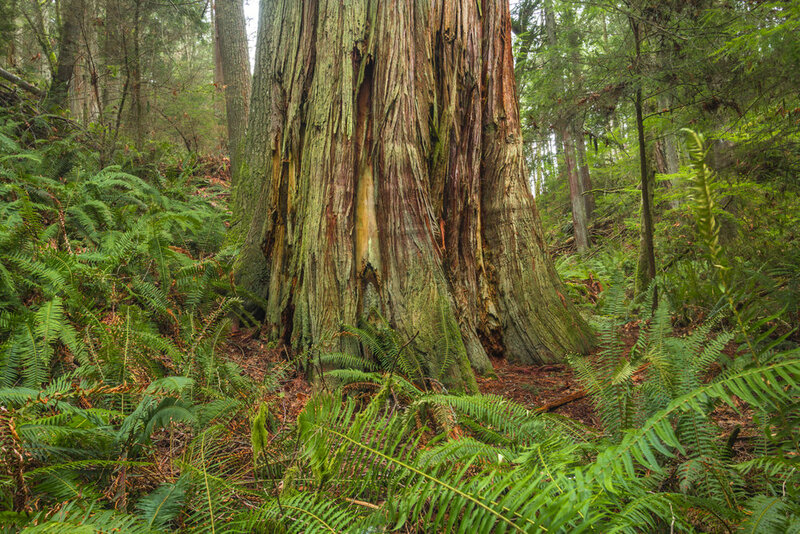 With the fall of the Quinault Big Cedar by Lake Quinault, the Duncan Cedar was crowned as Washington’s largest cedar. Perhaps the most accessible of Olympic National Park’s four rainforests, the Quinault is not so much a valley as a series of drainages surrounding Lake Quinault. Both the north and south end of the lake contain beautiful old-growth forests accessible to hikers of all skill levels. The north end is less developed and sees less foot traffic than the south, particularly after the tragic fall of the Quinault Big Cedar, but there are some amazing trails including the Maple Glade Trail (picture one), which looks like a rainforest wonderland. Many of Olympic National Park’s biggest and tallest Douglas firs can be found on the south end as part of the Quinault National Recreation Trail System (picture two). The South Fork of the Hoh River is formed by the Hubert Glacier on the south flank of Mount Olympus, and flows west into the main stem of the Hoh River near the Olympic National Park Boundary. While the Hoh River Trail is among the Park's most popular hiking and backpacking corridors, the nearby South Fork Hoh River Trail sees a fraction of the traffic and offers genuine solitude in a pristine old-growth rainforest. The first section of the 8-mile trail passes through new-growth trees (picture one) but the rainforest experience of seeing everything covered in moss, grass, and ferns is just the same. Further on, the trees grow larger and the trail passes by Sitka spruce trees that dwarf curious hikers. The valleys around Mount Rainier, Cascadia’s tallest mountain at 14,411 feet, generate enough precipitation to produce stellar Cascadian old-growth forests. From Mount Rainier National Park to is home to a number of beautiful trails that lead through giant Douglas fir, hemlocks, and cedars. Due to its “National Park” status these ancient forests are protected from the extensive logging and deforestation that occurred beyond its borders. The result is miles of undisturbed giant trees, rain-soaked moss, rich plant-life, and abundant wildlife. The Carbon River Trails, located at the very northwest section of Mount Rainier National Park, are a series of short hikes through a unique ecosystem: an inland temperate rainforest. Carbon River Road used to run through the area but repeated flooding prompted its permanent closure. Now, hikers and mountain bikers can walk or ride the road and observe humongous trees at a slower pace (picture one). The trails radiating from the Carbon River Road include the 3.4 mile roundtrip (9.6 mile roundtrip from ranger station) to Ranger Falls and Green Lake; and the 0.4 mile roundtrip (8.0 mile roundtrip from ranger station) to Chenuis Falls. The much shorter and kid-friendly 0.3-mile Rainforest Loop Trail begins right from the ranger station (picture two). Two of Washington’s best Cascade rainforest hikes exist deep in the perpetually saturated valleys of Mt. Baker-Snoqualmie National Forest. Lauded by big tree enthusiasts, including the great conservationist, Randy Stoltmann in his “Hiking the Ancient Forests of British Columbia and Washington,“ the twin Baker River Trail and Baker Lake Trail are easy trails with little elevation gain through the verdant Baker River Valley. The Baker River Trail is a 5.2-mile hike through stream crossings and past open areas filled with young alder, huckleberry and salmonberry. The trees here are draped in moss and ferns (picture one) and very old, including one remarkably huge cedar near the beginning of the trail (picture three). Tucked away in the Glacier Peak Wilderness section of Mount Baker-Snoqualmie National Forest, the North Fork Sauk River Trail passes through true Cascadian old-growth wilderness for its first 2-3 miles. Given that the area receives substantial snowfall in the winter, it’s amazing that the trees here have time and ability to grow as big as they do. Further north, titanic western red cedars - some of the largest in the Cascades - grow in the Harold Engles Memorial Cedars Grove. One of the largest trees along the primitive trail is over 14 feet in diameter (picture three), rivaling even some of the redwood trees of northern California. The entire grove is dedicated to the late Harold Engles, a Forest Service District Ranger who committed considerable effort to protecting these trees from logging and removal. His work now allows giant tree enthusiasts the opportunity to step back to a time when the forest had laid undisturbed for centuries. Between the towering mountains of the Cascades to east and the coastal rainforests to the west, is the great Puget Trough ecoregion - a large inland arm of the Puget Sound and the home a majority of Washington’s population. Though most of the old-growth forests here are gone, small pockets of conserved areas do exist. Giant trees can be found on places as diverse as island parks like Deception Pass State Park (picture one) or lowland forests like Lewis & Clark State Park (picture two), which really highlights how adaptive old-growth forests can be if left undisturbed. Click here for more Giant Tree Guides!